← Royal Ascot: A Day at The Races! Grab your wands and your broomsticks Potterheads…The Wizarding World of Harry Potter at Universal Orlando has expanded and is launching July 8th! With nary a new Harry Potter book or film in sight, Potterheads have had to work fairly hard to keep their passions alive…and relevant. Facebook pages and websites dedicate themselves to every aspect of JK Rowling‘s seven bestselling books about the boy wizard, but Potterheads need more! Thank God for Universal Orlando which not only created the new PotterCon this year but also gives US fans the opportunity to immerse themselves in the imaginary world of wizards and goblins via The Wizarding World of Harry Potter. It’s sort of our consolation for not having the actual Harry Potter Studio tour in our backyard like the Brits have. 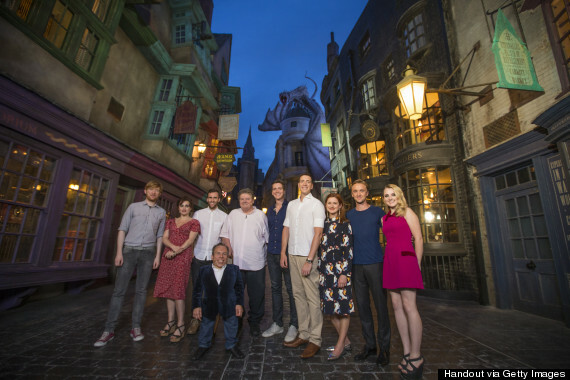 On Wednesday, June 18, members of the “Harry Potter” cast descended upon Universal Studios’ Wizarding World of Harry Potter to get a sneak peek at the theme park’s soon-opening Diagon Alley attraction, which is a “Phase 2” in their Harry Potter offering. Amongst the cast members that showed up were Helena Bonham Carter, Robbie Coltrane and Tom Felton. From left to right, the picture features: Bill Weasley (Domhnall Gleeson), Bellatrix LeStrange (Helena Bonham Carter), Neville Longbottom (Matthew Lewis), Professor Flitwick (Warwick Davis), Hagrid (Robbie Coltrane), the Weasley twins (Oliver and James Phelps), Ginny Weasley (Bonnie Wright), Draco Malfoy (Tom Felton) and Luna Lovegood (Evanna Lynch). The shiny new addition to Universal’s Wizarding World, Diagon Alley, is faithfully recreated from the films and features The Leaky Cauldron which serves up pints of Butterbeer (and it’s delicious, I’ve tried it! 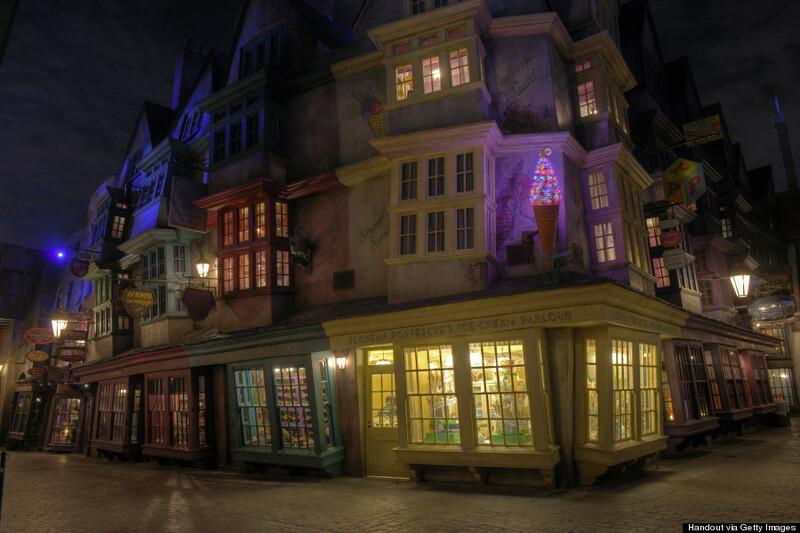 ), Ollivander’s Wand Shop, Florean Fortescue’s Ice Cream Parlour, Weasleys’ Wizarding Wheezes! 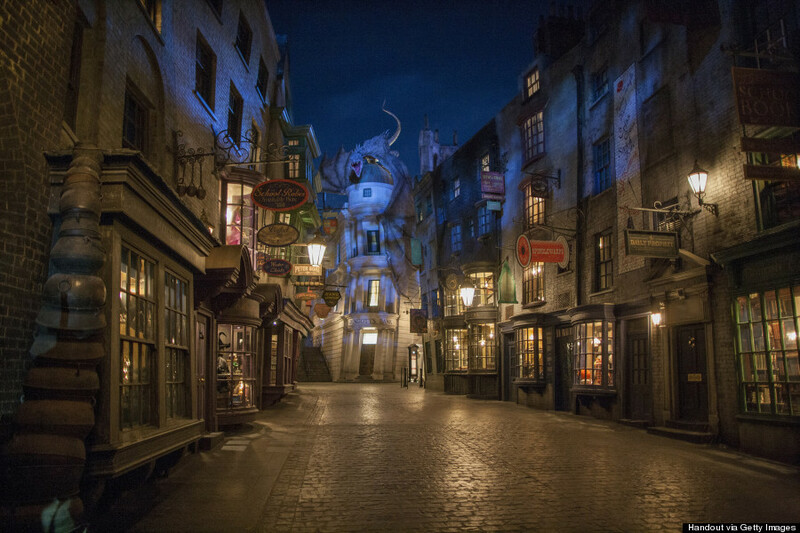 Grab your wand at Ollivander’s then go for a butterbeer at the Leaky Cauldron! And, of course, the Hogwarts Express….which you can now actually board, which you couldn’t before….but wait, there’s a reason for that. 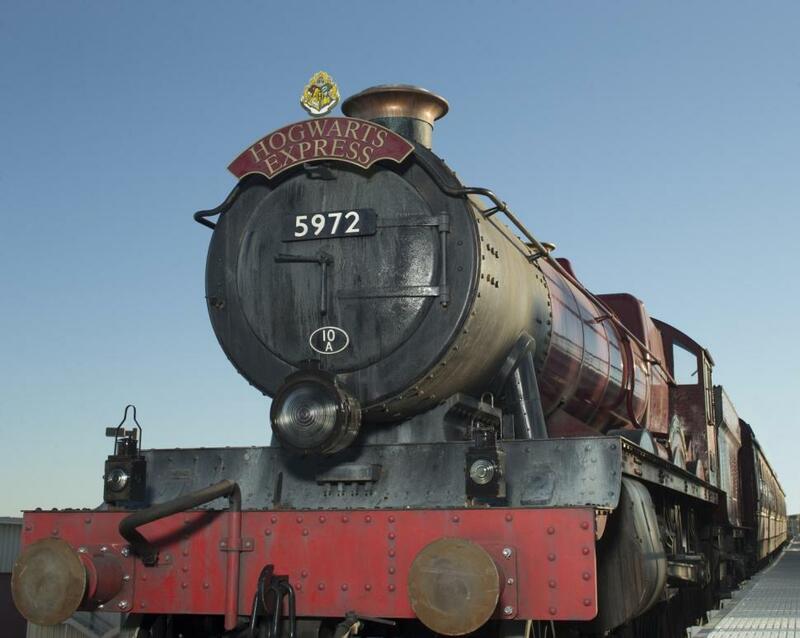 The Hogwarts Express…now taking passengers! 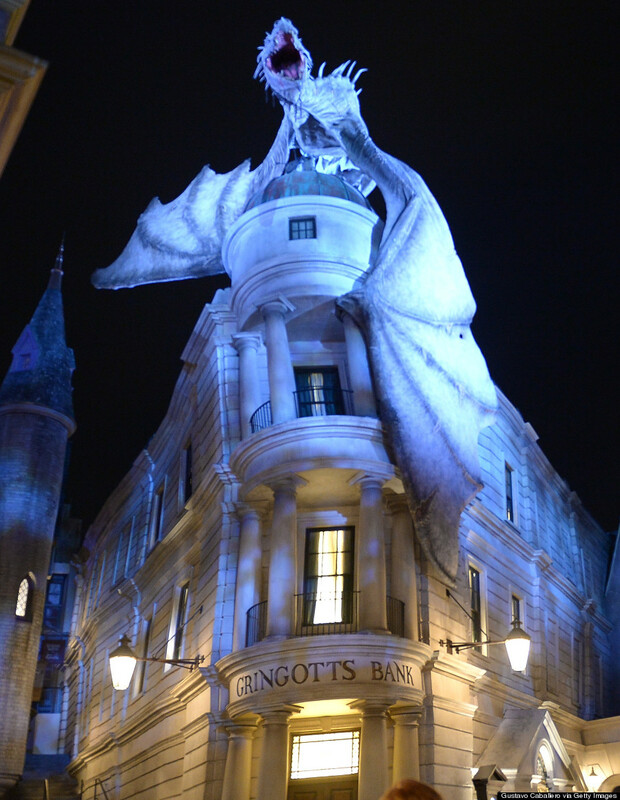 At the far end of Diagon Alley™ stands Gringotts™, the goblin-run bank. Inside is the newest attraction and one to surely make the lines wrap around the park this summer, “Harry Potter and the Escape From Gringotts”, a pulse-pounding adventure on a multi-dimensional thrill ride that puts you right in the middle of the action as you navigate your way through the perils of the Gringotts vaults – encountering Harry, Ron, and Hermione along the way! Looks pretty intense right? Can’t wait to try it out? Me too! Now here’s the kicker, which I didn’t know until now: Diagon Alley is part of “Phase 2” of Universal Orlando’s Wizarding World attraction, and is actually located in Universal Studios theme park…while “Phase 1” — the original Wizarding World offering, the one that features a re-creation of Hogwarts the School of Witchcraft and Wizardry and the magical shopping village, Hogsmeade — is housed over at Universal’s Islands of Adventure. 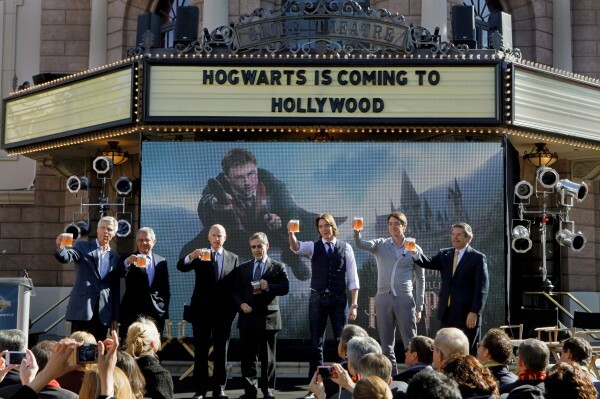 That means fans who want to see BOTH parts of the Wizarding World of Harry Potter (and who wouldn’t?) have to purchase a two-park ticket…which incidentally costs $136 per day for adults, $130 for kids! That’s before butterbeers, stuffed owls and designer wands, by the way. I honestly don’t know how families do it these days. Greedy Goblins if you ask me. And how do you get from one Wizarding World to the next? Silly question. Why the Hogwarts Express naturally! Thank goodness it’s included in the price of the ticket! Ya think they’d throw in a pack of Bertie Bott’s Every Flavor Beans and a pint of butterbeer for the journey, for what these ticket costs….but they don’t. 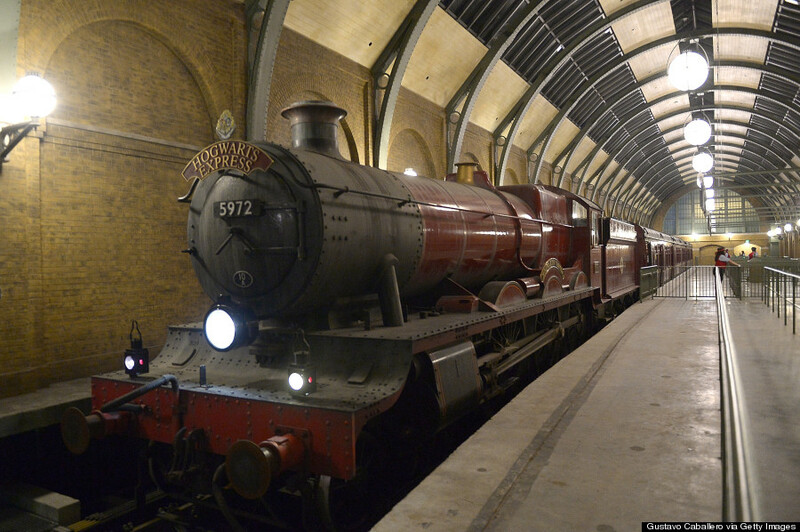 All aboard The Hogwarts Express…you paid for it! I wonder if the Honeydukes Hogwarts Express Tea Trolley goes by? Pack of droobles please! If you’re a true Harry Potter fan you’re not going to care how much gold you need to withdraw from Gringotts Bank…you’re going to be in Hogwarts-heaven! If you’re not…its still a fun and exciting attraction to visit. Be warned, however…the lines are long! And by long, I mean…wrap-around-the-park long. When we last visited Harry’s Wizarding World (Phase 1 in the other zip code…) there was a line just to get into the area where ‘PotterLand’ was, let alone the ride! And it was crowded. So cast a patience charm on yourself and enjoy! Incidentally there was no sign of the “Magical Three” Harry Potter stars Daniel Radcliffe, Emma Watson or Rupert Grint at this re-launch…one can only hope they’re saving their appearance for the opening of the West Coast version at Universal Studios Hollywood…where I’m fairly sure The Wizarding World of Harry Potter is going to be located all in ONE amusement park! …Unless the mouse down the road offers them additional housing. But that’s not until 2016….I’m going to be an old witch by then. Lady Anglophile…ready with wand in hand! This entry was posted in Home Page Posts, Lady Anglophile Reviews & Other Bits and Bobs and tagged Harry Potter, Universal Orlando, Wizarding World of Harry Potter. Bookmark the permalink. 3 Responses to NEW Wizarding World of Harry Potter Launches at Universal Orlando!